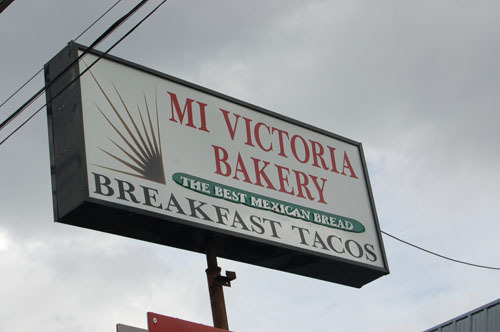 So, I’ve driven by Mi Victoria, located at 5245 Burnet, a number of times before stopping in this morning. I like the overall look of the place, some of the tables are an appealing, bright yellow color. I typically feel a little apprehensive about new taco spots…heaven knows there are bad tacos out there. I felt relieved when we walked in and found the spot full of all kinds of people. A crowd is always a good sign, and there were families with little kids, single folks grabbing a bite, ladies meeting to chat and have cake, all sorts. 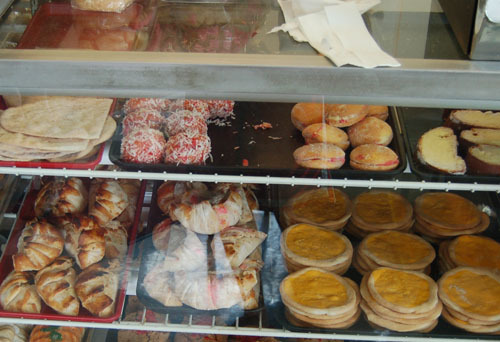 Mi Victoria is primarily a bakery, and the display cases of sundry treats takes up a large part of the storefront. There are cookies, empanadas, and other postres. There was also a big guy in the kitchen making frosting roses for a cake. He had a towel headband on, and looked really tough. Too tough to photograph, but I really admired his frosting stylings. I liked the large variety of treats, though I find some of them kind of intimidating. Namely, the pink ball-shaped things with coconut flakes. I bet they’re good, but I’ll never know. Regardless, I wasn’t there for pastries, I was there for tacos, so that is what I got. Potato, egg, and cheese to put a point on it. One caveat for non-meat eaters like myself, twice I found meaty bits in the tacos. I did take a gander at some of the other non-veg offerings, and I thought they looked pretty good. Some people let me take a picture of the beef tacos and bowls of pozole. The pozole was quite popular, and I saw lots of people eating it. All in all, I definitely recommend Mi Victoria. Not too spendy either. 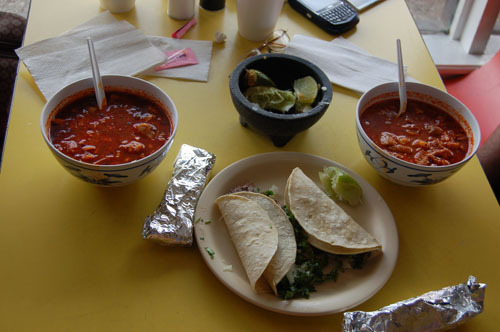 This entry was posted in Cheap Eats, Tacos on November 11, 2007 by Elizabeth. Welcome to the block TacoAustin! the al Pastor is very good here…As is the Picadillo Beef. 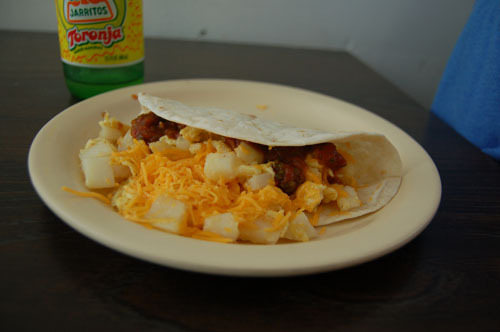 The chorizo is too greezy for some, but i think its just right…Last time I had a al pastor GORDITA, which was righteous…the counter ladies are always cordial, though they speak no english. 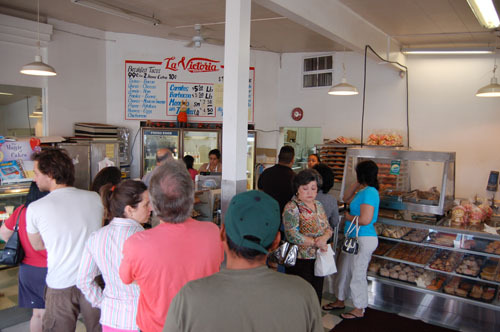 All in All, Mi Victoria is one of the few great taco joints in that part of Austin. come to tacotown.org for more reviews and mexi-musings. hi well i am glad you enjoyed the vist. i am daughter of the owners and i really enjoy to know what our customers think. i understand many problems such as parking, seating area, ect. is a big problem and may cost us your service. but honestly we try our best. the bakery is run by my dad Martin, who does all of that baking by himself (he does have helpers but it doesnt compare to his work), and really tries to satisfy with freshly made bread daily. its alot of hard work, but he does each pastry by hand 364 days a year. (not counting xmas). but he is all about quality and perfection. i honestly wish everyone would know the hard work and struggle that goes on day by day. i do hope everyone enjoys their vist, and any suggestions about our service please do tell. thank u, victoria. Uhh, they all speak and understand English fine. Cabeza must speak some kind of english-crazy pidgin. 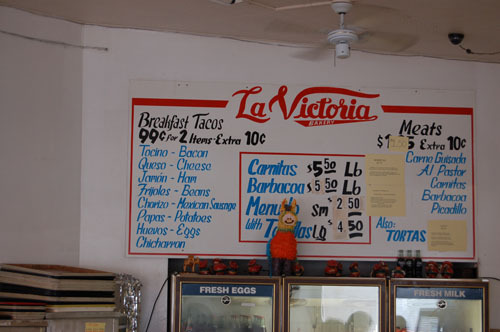 Mi Victoria has some of the best and cheapest breakfast tacos i’ve had since leaving taco mecca–San Antonio. I too appreciate the greasiness of their chorizo. nom nom.